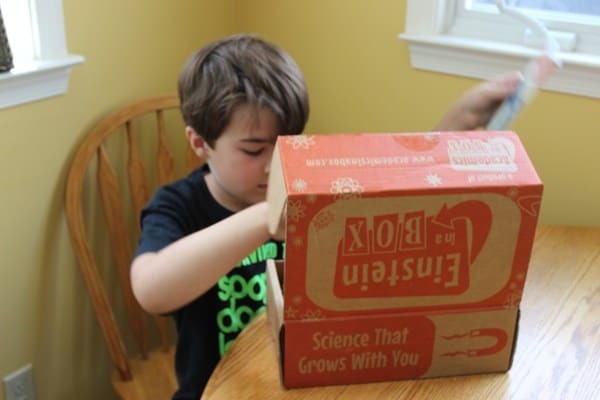 Groovy Lab in a Box Equals STEM Fun! Have you ever heard of STEM? STEM stands for Science, Technology, Engineering, & Mathematics. 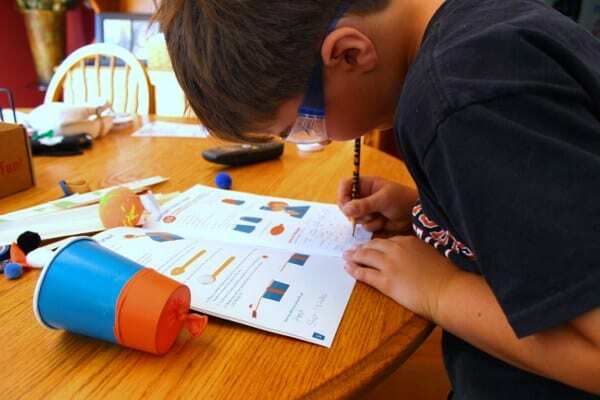 STEM is becoming a household name with families who have school age children. What was once a foreign concept in schools has become more the norm as students have embraced STEM activities within, as well as outside of, schools. 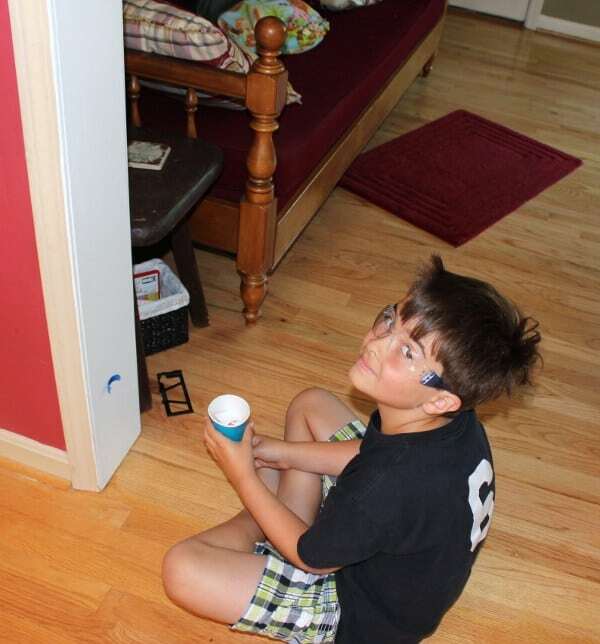 My son thoroughly enjoyed a week-long STEM camp called Camp Invention this summer. Adding to that, I discovered Groovy Lab in a Box. 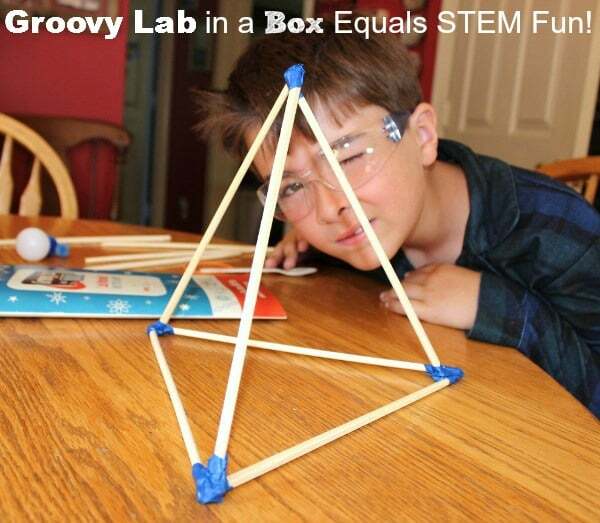 As my son and I found out recently, Groovy Lab in a Box equals STEM fun! Groovy Lab in a Box is a very cool monthly subscription service, similar to that of a magazine subscription. 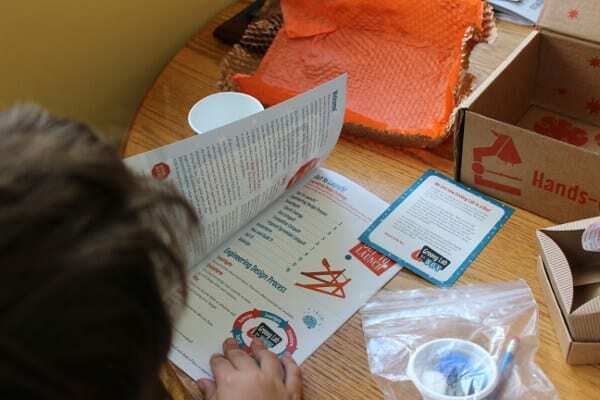 With Groovy Lab in a Box, your child will “receive boxes full of everything you need to learn about and do hands on science, technology, engineering, and mathematics (STEM) experiments for ages 8+”. I contacted Groovy Lab in a Box and asked them if they could send me one of their boxes in exchange for a blog post review. They were happy to oblige! We received our box in the mail and couldn’t wait to open it up to see it’s contents. The box contained a Groovy Lab in a Box ‘Lab Notebook’, a compostable box with lid, chopsticks, blue masking tape, a compostable wooden spoon, rubber bands, a glue dot, a compostable cup, a balloon, a blue paper cup, tape measure, safety goggles, and projectiles: ping pong ball, pom poms, cotton balls & a foam ball. I’m not gonna lie, at first I was a little bit intimidated by what we had just committed to do with this project. I think I was more intimidated than my 8 year old son. 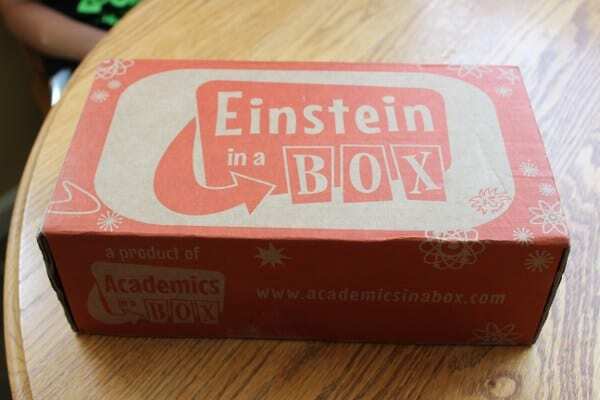 But as we read through the Lab Notebook and began the first of three ‘Investigation’ activities, we started to have so much fun and forgot that we were actually extending our minds ‘outside of the box’ (funny how it comes in a box). The first ‘Investigation’ activity for our ‘Out to Launch’ Groovy Lab in a Box was to create a Box Catapult, using the instructions in the Lab Notebook. 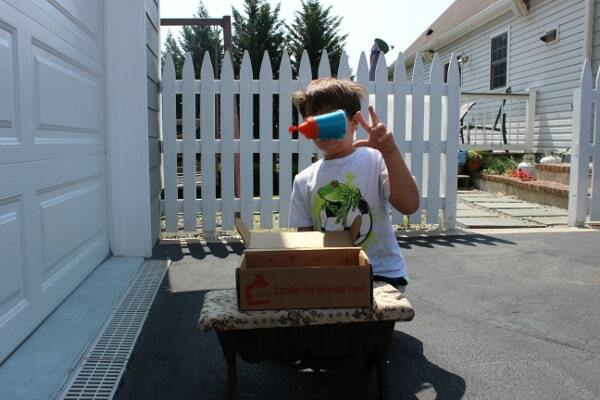 As you can see from the picture below, my son had a blast with it. Even our cat, Mattie, was intrigued. Do they have cat goggles? 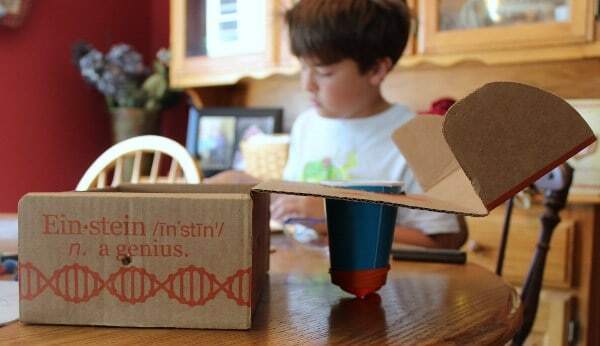 Hmmmm, maybe my little STEM-ist can invent them! The second Investigation activity was to create a Trampoline Catapult. This one was lots of fun. 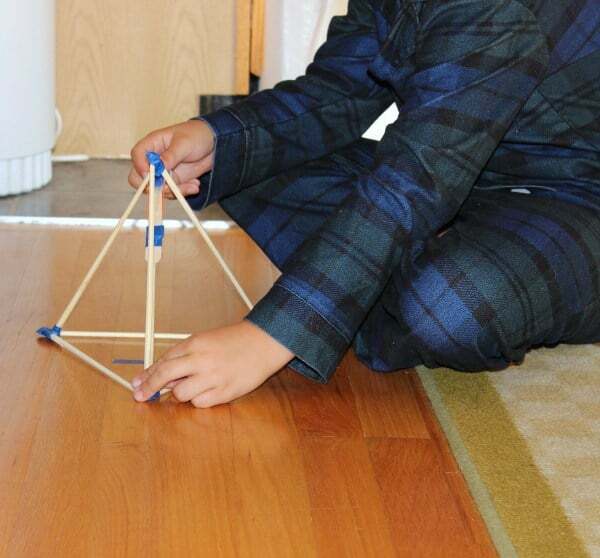 We quickly found out that we were better off testing this catapult out from the floor, or better yet, outside. Different projectiles produced different results. The foam ball didn’t go very far. However, the pom pom shot up like a rocket. My son was really getting into it. 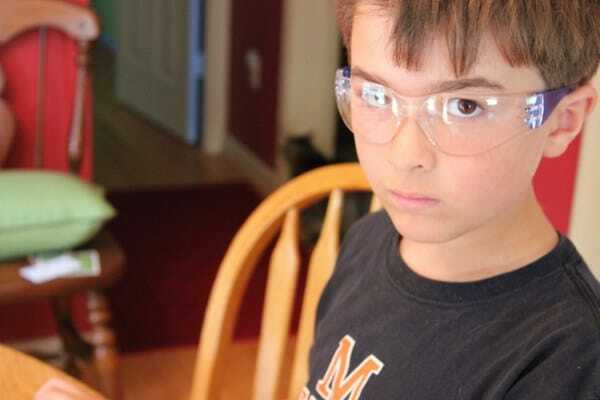 He looked like an official STEM-ist with his goggles on. After each Investigation activity, the ‘Launch Engineer’ (my son) would record his data in his Lab Notebook in the ‘Heavy Launch Mission Report‘. He would record what projectiles he used (doing 3 trials), what his predicted distances were, and what the actual distances were. 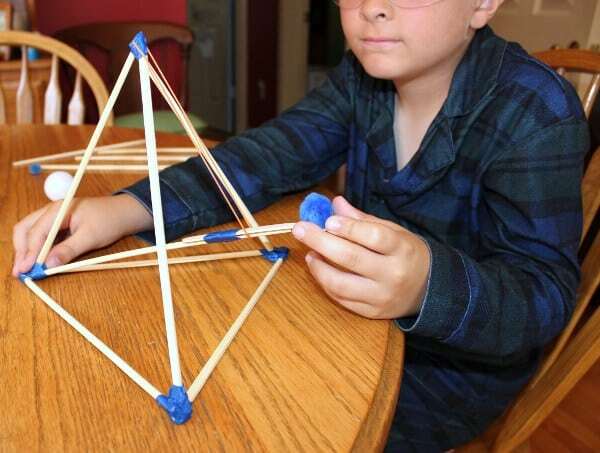 The third and final Investigation activity, was the Trigonal Pyramidal Catapult. Say that 3 times fast. 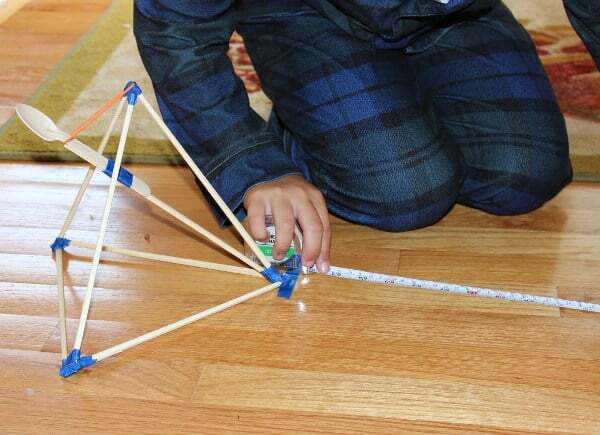 This catapult was the most complicated catapult to create, but also the most fun. Once created, we tried out different projectiles. We were better off putting this one on the floor. My son is obsessed with measuring things, so much so, that he asked for a 300 foot measuring tape for Christmas. 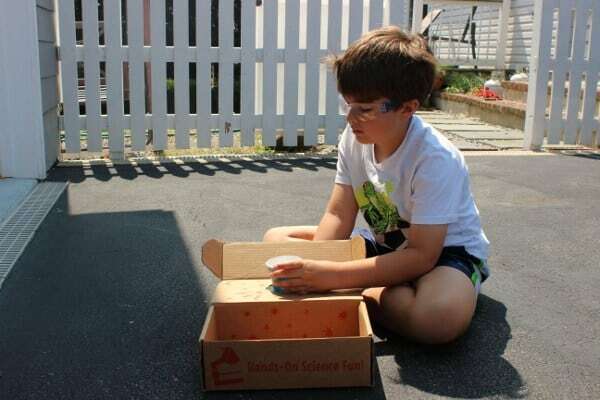 We have quickly realized that STEM and Groovy Lab in a Box is TOTALLY his thing. After gathering all of the data from the 3 Investigation activities, it was time to brainstorm. The ‘Out to Launch!’ Engineering Design Challenge was this: “Can you design and build a catapult that launches projectiles the farthest distance using only the materials in your Groovy Lab in a Box?” Based on the information we had, the Launch Engineer is asked to draw out 5 brainstorms of ways to design a catapult. The criteria was that you must only use the materials that came in the box. In addition, only 3 attempts are allowed with the longest distance used for scoring. My son, with the help of his groovy Dad, drew up 5 brainstorms. The ‘Final Design Plan’ was one that we felt would work the best based on Groovy Lab in a Box’s ‘desired specifications of the catapult’s design: Lighter, easier-to-carry catapults score higher than awkward, heavier ones. Freestanding catapults score higher than catapults that must be held down. Catapults should send the projectile at least 2 meters (approximately 78 inches or 6 1/2 feet) , with a higher score for longer distances. We chose the trampoline catapult as our Final Design Plan. Based on our prior Investigation activities, this type of catapult produced the best results as far as distance was concerned. We cut a hole through the lid of the box the size of the mouth of the cup. 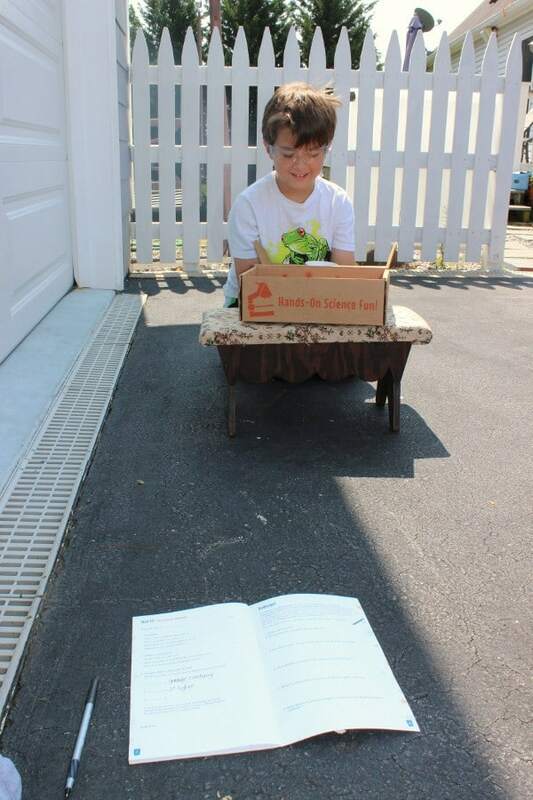 We set the box on a flat surface outside next to our garage. This way we could use the height of the garage as a way to measure the distance that the projectile would go up. 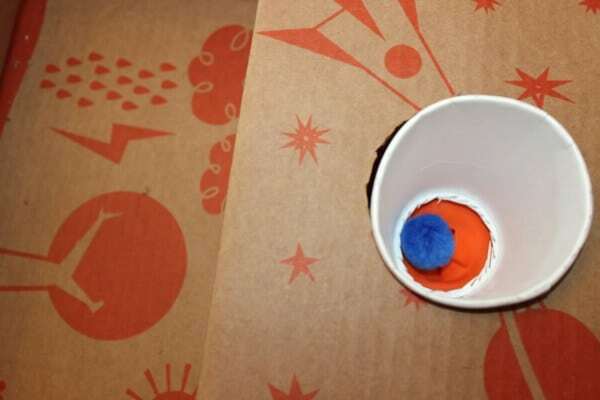 We decided to use the big blue pom pom as our projectile because, based on our data, this projectile flew the furthest. After our first attempt, we realized that the catapult was sitting too close to the ground, which made it awkward to use. 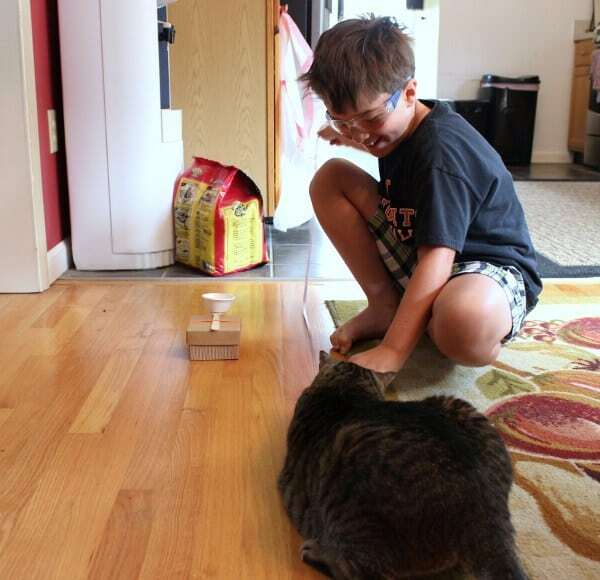 So we brought out another flat surface – a footstool to raise up the catapult. 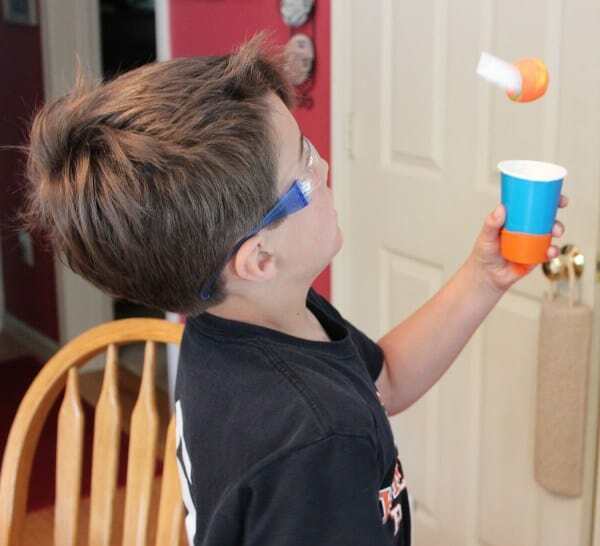 My son also had to learn how to hold the cup properly in order for the projectile to have the optimum chance of producing the furthest distance. The results? Each of the 3 trials were successful! For all 3 trials, our projectile went 2 1/2 meters (a little over 8 feet). 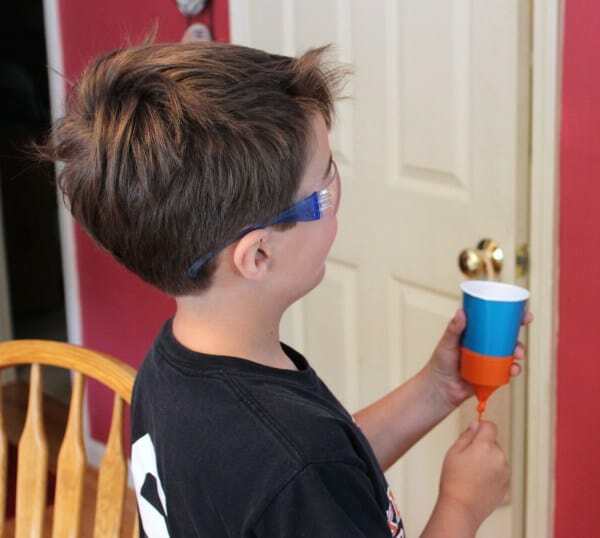 This was a really fun activity to do with my son. The age for Groovy Lab in a Box is 8 years and up. My son just turned 9. 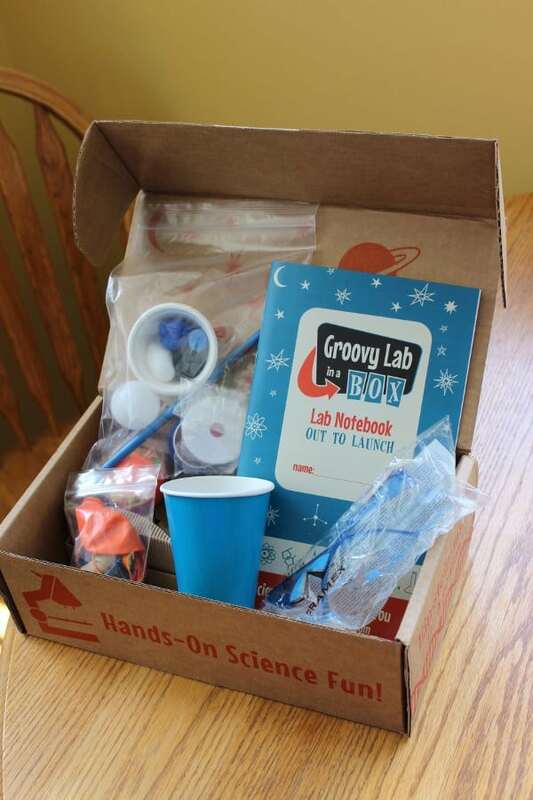 For safety reasons, Groovy Lab in a Box requires adult supervision and assistance for all of their activities. It’s a great parent/child activity experiencing the thought processes that go into such a project together. Groovy Lab in a Box encourages their projects be done as a group activity. So if your child has siblings or friends to do this activity with, all the better. Or Mom & Dad will do too! As you can see from the pictures, this Groovy Lab in a Box isn’t something you can get done in an afternoon. As a matter of fact, Groovy Lab in a Box encourages STEM-ists to take their time in every aspect of this project. For us, we would do a couple of activities and then set it aside and come back to it when we could. Hence the reason this is a monthly subscription and not more frequent. 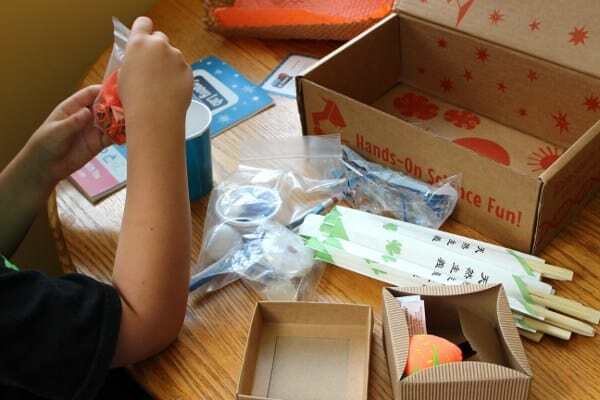 Check out their website, Groovy Lab in a Box, for subscription pricing, single box pricing, their fun blog, activities you can do ‘beyond’ what’s in your box, and a huge array of STEM resources and videos. They even offer ideas for how to recycle your box. My little ‘Launch Engineer’ is now considered a STEM-ist: “An expert in applying science, technology, engineering, and mathematics. Creator, explorer, inventor…STEMist!” Has a nice ring to it, doesn’t it? DISCLAIMER: I received the above mentioned product at no cost in exchange for writing this review. However, the expressed opinions in this review are solely my own. Loved this one–couldn’t wait to scroll down to the next picture/challenge! Dominic looks so grown-up in the pictures (of course adorable). What a great summer-time, educational experience. Where in the world did you find out about this? You are a great mom! What a wonderful way to spend some time with young people. STEM activities are all the rage within the inner city especially with young girls and people of color. I will check out the Lab in a Box. I think my niece would love the projects inside! Thank you Char. Yes, STEM is becoming more and more popular. It’s a great way to think outside of the box. I think you just found the perfect gift to give my niece and nephew for Christmas this year. They would LOVE this. Thanks for the review! Thank you Leslie! It would be a great gift idea.